Ok! So I'm at it again for another submission to the Celebrity Makeup contest sponsored by Makeupbee.com and BH Cosmetics. This is turning out to be quite fun! 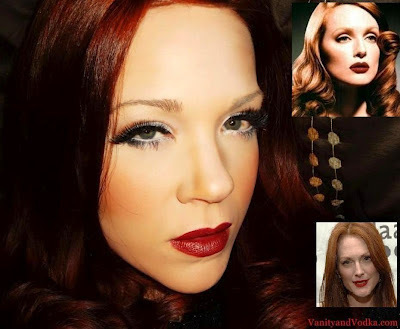 So I went for a Hollywood Glam look that I found being fiercely werked by Miss Julianne Moore (another favorite redhead!). It's a little bit different from the usual Marilyn Monroe, or retro glam pin up. There is a lot of facial contouring and dark shading on outside corners of the eyes. The eyeliner is delicate. The brows are muted. However- it does feature the classic red pout that is synonymous with Hollywood Glam since the beginning of Hollywood Glam! It turned out quite lovely. I hope you like it! I just want to say that I really appreciate all the wonderful feedback and communication I've been getting. It really means the world to me. Thank you so much!! Thank you for appreciating the magic of makeup like I do. You all are the best! Thank you so much Jasmine!!! Happy Tuesday to you as well :-) Thank you for the smiles!! sooo wow! i love it so much :).. amazing! i followed you,hope you can follow me back. I just want to say that I really appreciate all the wonderful feedback and communication I've been getting. It really means the world to me. Thank you so much!! !!!!!!! Sweet!!! *High Five* Thank you, Janine! You are too adorable! LOVE your makeupppp!!!! now following. Thank you so much!! Likewise! Thank you!!! I am planning on doing more!! SO glad you like them!